Party season is here, starting with Halloween, which will be followed by the many Christmas and New Year parties, and other occasions to gather and celebrate with family and friends all filled with moments you can immortalize through instant photo prints that last. FUJIFILM Instax Mini Cameras have become extremely popular, not just among the younger set, but anyone who loves to take photos of important life events, loved ones, and travels, and see these instantly in credit-card-size prints they can keep. And now FUJIFILM is set to introduce the newest model to join the ‘Instax Mini’ series of instant cameras: the Instax Mini 70. Touted as the party camera, the Instax Mini 70 boasts of the Auto Exposure Control Function that captures both the main subject and background in natural brightness. It does away with the rather tedious task of having to configure a special setting. Just press the shutter button, and the camera can automatically detect the surrounding brightness then adjust the shutter speed and flash amount accordingly. The result? Images with a natural brightness, even those taken indoors or at weddings, which tend to have darker backgrounds when captured with conventional cameras. The Instax Mini 70 is also equipped with the new “Selfie” mode intended for, well, just that: taking “selfies.” Choose the Selfie mode so the camera can automatically adjust the brightness and shooting distance to the level optimized for selfie shots. There’s even a selfie mirror beside the lens so you can check the framing to achieve the best angle. Features such as the self-timer function and tripod mount are useful for all your family and barkada group shots. 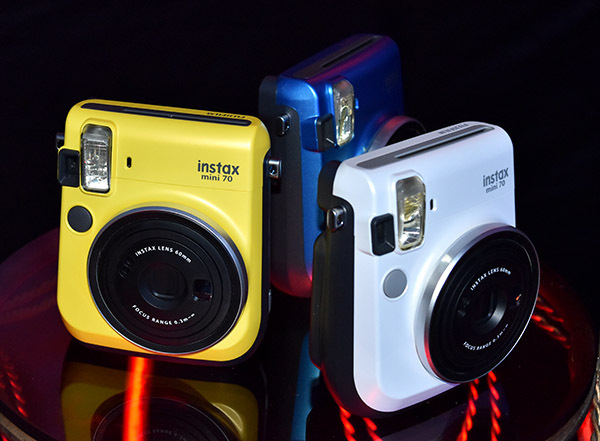 The Instax Mini 70 will sell for Php6,999, and all these cool features and more are packed into a modern and stylish body that comes in three colors to suit a variety of styles: Canary Yellow, Island Blue, and Moon White. The new Instax Mini 70 makes for a trendy fashion accessory you can bring around anywhere, anytime, whether you’re young or young-at-heart, male or female, a student or a yuppie, a partyphile or a travel junkie.